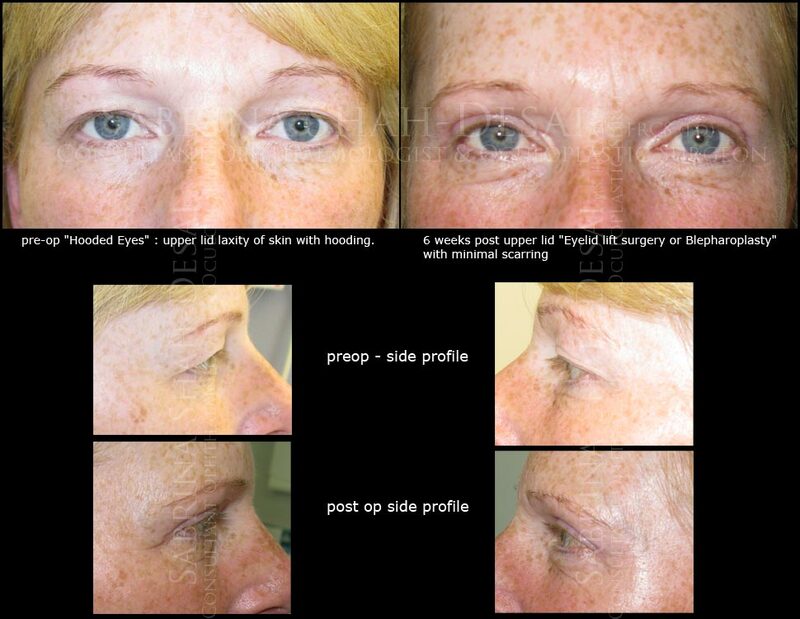 Case Study : Surgery for hooded eyelids (blepharoplasty) | Aesthetic Treatments in UK. MH, 48, a secretary from Essex. ” I had been thinking of having surgery on my saggy upper lids for about 18 months. I was fed up with the fact that when I tried to put mascara on, the sagging eye lid was hanging so low, it was touching my lashes. I talked to my husband about having work done, and he, a surgeon himself, tried to talk me out of it. But I was determined. I did a lot of research about what it would look like afterwards, the pain endured, the recovery time, the actual procedure, everything. I found Ms Sabrina Shah-Desai through research and went to see her for a consultation first. Ophthalmology is very precise, very neat, only leaving tiny scars, which was higly appropriate, as I didn’t want it to look obvious that I’d had something done. As soon as I met Sabrina, I knew she was the one to do my surgery. She was very thorough, talking me through everything and listening to what I wanted. She talked to me about wearing make up and realized how upset I was about the way the eyelids had sagged. I went in for the surgery at 12.30pm and was out by 2.30pm. I opted for just a local anesthetic without sedation. It was very quick, but it isn’t an instant fix. I looked horrendous for about two weeks afterwards, literally like I’d been beaten up. But by day five, the bruising had spread down past my cheeks – but this is normal. The skin started to heal two to three weeks later, but the pain took less than that to subside. Due to my fair complexion, there were still some red lines from the stitches, but these disappeared after around six weeks. It took about three months to completely heal. Sabrina did a fantastic job and called me a couple of days later to check I was recovering ok. I’m thrilled with my new look. It’s made a huge difference, and even my husband says it looks great.